We have seen a promising surge of new applications aiming to increase employee wellbeing. With the increase of applications I expect to see more evidence on what the design strategies are that work. The design is elegant and playful. It engages users in small easily-acheivable healthy activities as part of "weekly missions". The provided activities are grouped into categories: 'Wellness', 'Productivity', 'Social', 'Environment' and 'Generosity'. It's not immediately obvious how the categories have been determined, but in terms of psychological wellbeing, it could be said that generosity and environment add meaning to our work experiences, while the social activities are aimed at increasing relatedness. Productivity includes activities designed to help us feel more autonomous and competent. Some features like 'disable notifications' may support other factors such as engagement or mindfulness. Finally, the wellness category is all about increasing physical health behaviours and improving eating habits. Engagement with the application is mostly driven by gamification strategies and social influence. This is a path taken by many companies, and vulnerable to the associated risks. for example, extrinsic motivators can undermine intrinsic motivation (the benefits of gratitude are lost if people thank others just to get points), and competition can hinder positive trusting relationships. To put in the terms of psychologist Paul Gilbert, stimulating our already overstimulated competitive drive system can undermine compassion and our affiliative system. 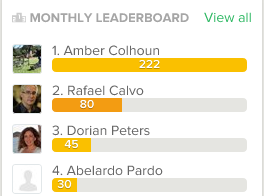 I like that OfficeVibe includes an easy way to credit others who were involved in an activity with you - a new take on sharing that feels less self-centered and acknowledges connectedness. 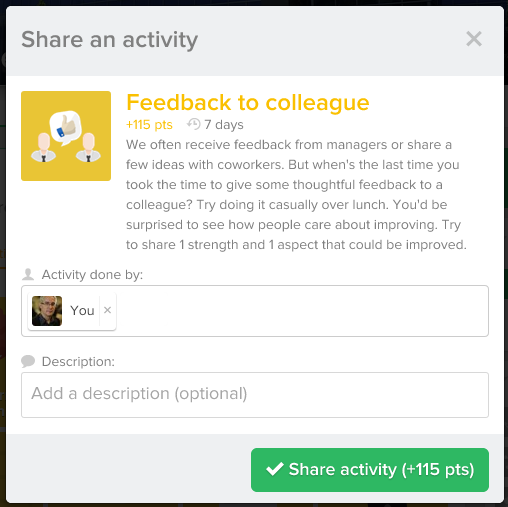 The sharing window also explains why the activity is good - a very valuable tool for educating people on factors that promote wellbeing. More predictably, you are also highly encouraged to proclaim your good deeds to the group. This part is optional but highly encouraged through the interaction design. Seeing your officemates' healthy activities can boost positive emotions and encourage you to engage in your own, but with everyone tasked with 5 activities a week, it does have the potential to create a lot of noise. The ramification strategies include both directly competitive (i.e. 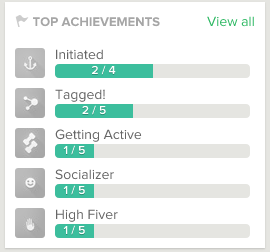 a Leaderboard) and personal achievement-based drivers (achievements to unlock and quotas to fulfill) . Engagement is also sustained via reminders to your inbox. Currently these reminders are framed as important deadlines. Whether these are perceived as a pleasant excuse to seek out a healthy activity or yet another weekly stressor that breeds resentment remains to be seen. In either case, it may be more to do with the presentation of the notification than the notification itself. 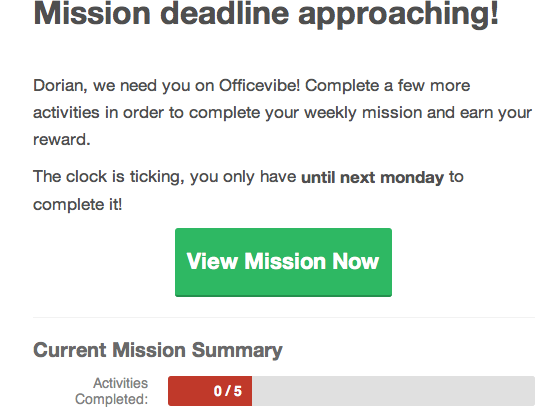 Overall we're enjoying our trial run with OfficeBVibe. Our own team's use is still in too early a stage to yield many insights from use but we'll keep you posted. OfficeVibe, based in Montreal, states that their mission is to "help people grow and gain motivation to succeed in the office, make healthy lifestyle choices, create an eco-friendly workplace, give back to philanthropic causes, and have them collaborate with their colleagues in and out of the office." The initial product is beautifully designed from the user interface perspective and its easy to see how included features target each aspect of their mission. Longer term research and testing will reveal which strategies work and which hinder the mission. I look forward to seeing research on the impact of the product on perceptions, attitudes, behaviour and wellbeing. Check out their CultureTalks video interviews section in their website where people from multiple companies share their views on workplace wellbeing.